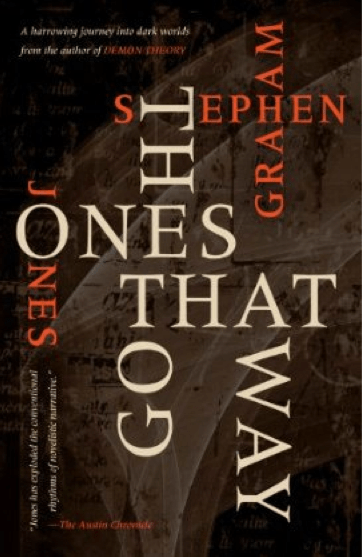 Just finished reading a very fine story collection by Stephen Graham Jones called The Ones That Got Away. It’s not The Ones WHO Got Away. There’s a story called “The Ones Who Got Away” but the collection’s title changes one word. No, really, it’s OK if you’re confused. The book collects thirteen stories published in a variety of venues ranging from more obscure journals and anthologies to the more prominent such as Cemetary Dance. In his story notes at the end, Jones offers entertaining and casual insights into the conception and crafting of each story, and in some cases talks about different versions of the story that existed along the way before he found a way to tell what he wanted told. I love this kind of stuff! It reminds me of the story notes that were always part of Harlan Ellison’s collections, which I looked forward to as much as the stories themselves. Jones seems to have such a humble attitude and likeable personality I imagine most readers will enjoy these bits, even those not looking for insight into the craft of writing. I’ve always preferred horror fiction with a greater emphasis on character and story than on monsters and gore. Sometimes, though, horror fiction with literary aspirations takes this too far, and downplays the horrific aspect so much the end result is not horror at all, but a vague, low-key sort of ennui. This collection manages that balance perfectly, with plenty of gruesome details and chilling scenes that never become gratuitous or cause eye-rolls. The first story, “Father, Son, Holy Rabbit” is exemplary. It’s a beautiful, sensitive story of fatherly love for a son, yet it’s also a tale so gruesome and disturbing as to cause nightmares. Despite its brevity, this story carries a serious payload. Some stories are stronger than others, as in any collection, but not one is less than good. I suppose “The Meat Tree” is the one I feel could be removed without weakening the whole. In every other case, Jones combines a vivid conceptual imagination with convincing characters and conveys the whole in an engrossing voice. The final novella (“Crawlspace,” original to this collection) is some of the most gripping and anxiety-producing fiction I’ve ever read. It’s hard to imagine a reader making it from the first story to the last without being impressed. The book was a finalist for a “Best Collection” Bram Stoker award, but was matched-up against the potent and masterful Occultation by Laird Barron (who wrote the introduction to Jones’s collection), and the book that won the award, Full Dark, No Stars by the world’s most popular author (doing some of his best work here) Stephen King. Some writers exhibit a single strength, but Jones has all the bases covered. His writing has an edge without losing accessibility, his stories address familiar tropes and concepts in a way that seems fresh, and he seems in every case fully in control of his world, its mood, and the effect it has on the reader. I recommend this book, and it has definitely convinced me to seek out other works by Jones.